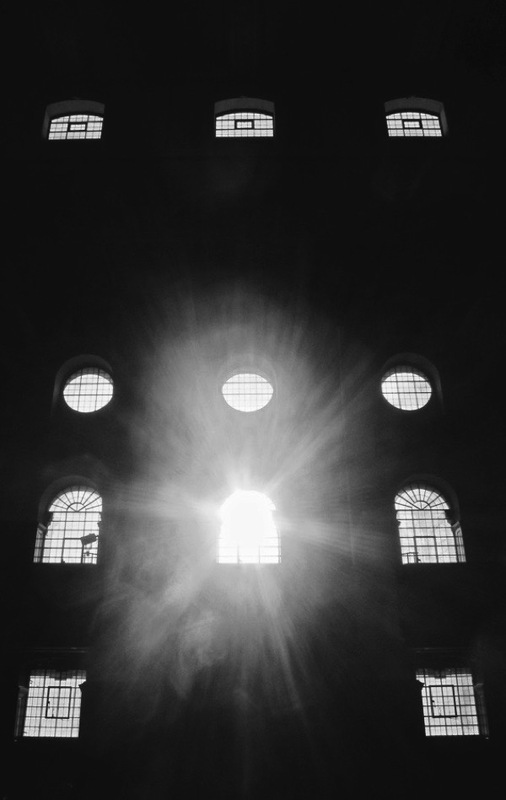 Owen Hopkins, Curator of Architecture at the Royal Academy & author of FROM THE SHADOWS, The Architecture & Afterlife of Nicholas Hawksmoor, published today, considers the enduring charisma of Christ Church, Spitalfields. A shadow appearing on a great expanse of stone, the early morning light pouring through a dirty window, a brass door handle worn smooth by centuries of use, the musty smell of an old room, the faint echo of steps climbing a staircase – we experience architecture everyday. Yet most of the time we do not notice it. In some ways, we should be glad of this. The buildings around us, even those we work or even live in, need to blend quickly into the background to allow us to go about our daily business. The last thing we need is a building constantly reminding us of its presence through bling-bling cladding, a gratuitously curving façade or its dumb oversized hulk. Fortunately, for the moment at least, most architecture is essentially background architecture. Rarely does a building stop you in your tracks and demand your attention. Rarely does a building hit you in the gut. Rarely does a building change how you see the world around you. 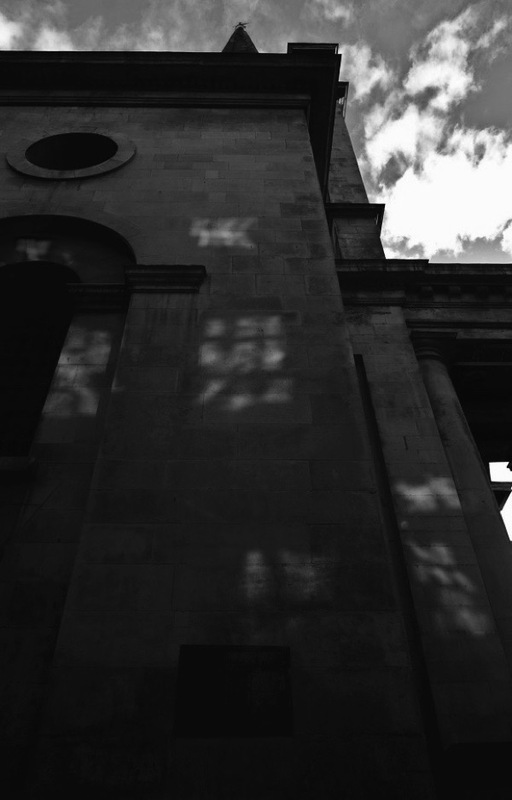 That Christ Church, Spitalfields by Nicholas Hawksmoor does all these things – and more – marks it out for me as truly special. 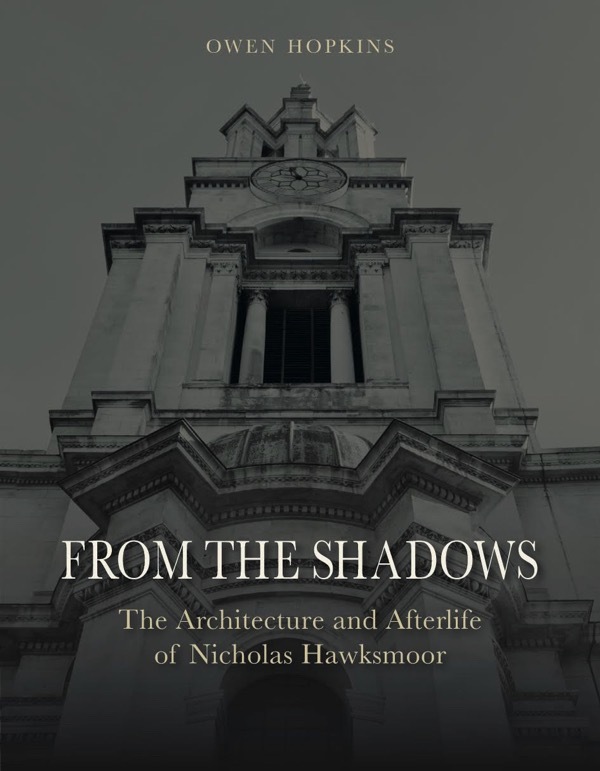 Over the course of writing my book about Hawksmoor and the various ways he and his buildings have been neglected, abused and celebrated since in his death in 1736, I have probably exhausted the vocabulary of words that can be used to describe the oddly affecting power of his architecture. Words simply cannot do justice to the raw essence of his gigantic compositions in stone. I always imagine the sensation of being confronted by Christ Church at the end of Brushfield St to be a little like how the first Grand Tourists must have felt encountering the Parthenon or the Pantheon, or even the Pyramids – monuments of antiquity that they might have heard about and even seen depictions, but of which the effect in reality is of a rather different nature. So, in a way Christ Church is akin to our own Roman ruin standing in Spitalfields, though now in a far from ruinous state. If the mausoleum that Hawksmoor designed atop a lonely Yorkshire hill at Castle Howard is the equivalent of the great Greek Doric temples at Paestum, then Christ Church is perhaps redolent of the Forum Romanum – the Temple of Saturn or perhaps the Temple of Castor & Pollux. Christ Church appears as if it was always there, before history and before time. It holds its own with the great buildings of Baroque neoclassical Europe, those of Fischer von Erlach, Boullée, Ledoux and Bernini. But it is another master that Hawksmoor probably bears closest comparison: the enigmatic Francesco Borromini, like Hawksmoor a creator of buildings that strike the mind and the emotions, and an inspirer of dark tales and mystery. Born in the mid nineteen-eighties, I never saw Christ Church in its legendary ruined state, when its powers were arguably even more intense. Growing up, I knew nothing of Hawksmoor and only a little of Sir Christopher Wren, having once made that startling ascent to the dome of St Paul’s and then the corresponding one to the top of the Monument. Studying History of Art at university, I was by chance assigned to a course on English Baroque architecture. 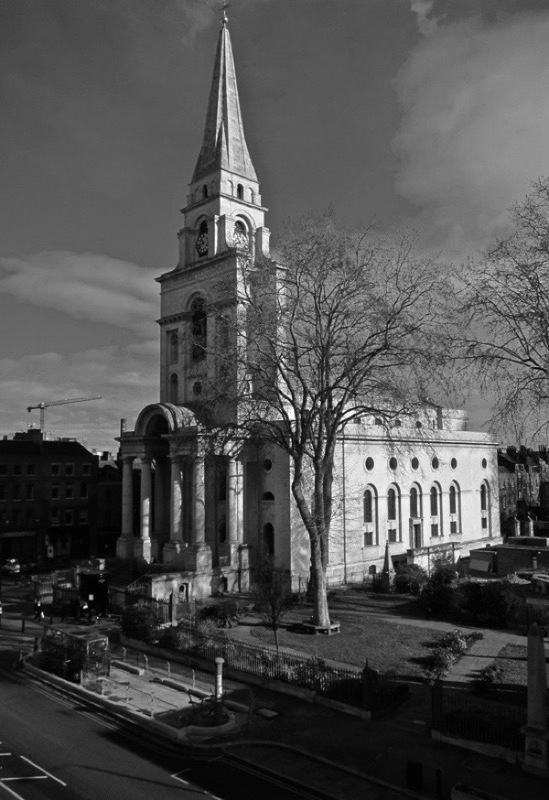 Looking at black and white photographs of Hawksmoor’s churches in books, I could not believe these buildings were here in London, so I immediately set off in search of them. Christ Church, the great gateway to the East End, was the first I encountered and the one I became the most familiar with, always making a point of stopping by on my regular visits to Brick Lane market, then and now a pilgrimage for the young and new in London. The longer I looked at it, the more I became mesmerised by its stark geometric plainness, the striking power of its composition and the extraordinary way, nearly three centuries after its completion, it still dominates its surroundings, physically and psychologically. It is easy to forget that a building like Christ Church is the product of a particular time and place, and – dare I say it – a particular architectural brief. It represents one of the finest examples of what since the nineteen-fifties has been known as the English Baroque – the brief flowering, around the turn of the eighteenth century, of an architecture conceived in terms of mass, of architecture almost as a sculptural entity. Along with Sir John Vanbrugh, Thomas Archer, and to some degree Wren and James Gibbs, Hawksmoor was one the English Baroque’s main protagonists, and the one – it is often considered – who pushed its ideals the furthest. Despite the name, the English Baroque really had nothing really to do with the Italian Baroque of Bernini and Borromini, and only very little with developments in Paris. England was a Protestant country and, to some degree, isolated from the cultural developments of Catholic Europe. The English Baroque was, therefore, sui generis, and directly traceable to Wren’s office in the sixteen-nineties – a relatively large and cosmopolitan melting pot of architectural ideas and invention to which Hawksmoor was absolutely integral. Almost nothing is known of Hawksmoor’s life before he entered Wren’s office around 1680 – a fact or lack of facts, made all the more tantalising by his meteoric rise in just over a decade to become Wren’s leading draughtsman and designer, and executor of buildings in his own right. By 1711, when he was working with Vanbrugh at Castle Howard and then Blenheim Palace, Hawksmoor was arguably the best trained architect Britain had ever produced and one of its more accomplished. It was natural for him to become involved with the Commission founded in that year, charged with building fifty new churches in London’s new suburbs. The backdrop to this was London’s expansion since the Great Fire beyond its old medieval walls into Bloomsbury and the West End, Bermondsey and Deptford to the south, and Spitalfields and along the river through Wapping and Limehouse to the east. The existing churches in these areas were unable to cope with the huge increases in population and many residents were falling into the arms of dissenting groups: Presbyterians, Anabaptists and the like. Parts of these new suburbs were smart and well-to-do, but the majority – particularly to the east – were poor, with some streets consisting of little more than a series of hovels leant up against one another. Some centuries were to pass before London was to lose its reputation for disease, poverty and vice. Looking back, it is no surprise that London’s expansion was a source of considerable anxiety for the city’s political and religious authorities, an anxiety they believed could be assuaged by a string of new churches. The brief was twofold: buildings that could accommodate large numbers of worshippers and, at the same time, act as beacons in the cityscape, signifying social and moral control over all they surveyed. In my analysis, it is this latter stipulation, which gets us to the core of why Hawksmoor’s churches, Christ Church included, look the way they do. The London that burnt in 1666 was largely a city of timber and thatch. The city that re-emerged in the following decades was one of brick, and even the houses of immigrant Huguenot cloth-weavers that survive around Spitalfields were adorned with classical columns and pilasters and elaborate, classically-inspired door-cases. While the lavish funding provided by the 1711 Commission would allow the churches to stand out in terms of scale and materials, utilising white Portland stone rather than brick, Hawksmoor’s role was to ensure they would do so in their design too, as an architecture of authority. Straightforward classical architecture was not an option. Instead, Hawksmoor looked to architectural history, to his own native Gothic and to the architecture of the early Christians and the Middle East, which he knew from engravings and written accounts. It was Hawksmoor’s genius to combine these disparate sources and references in single compositions that have coherence and integrity, while also being rich and resonant. At Christ Church, he took these influences – and architecture itself – back to first principles, punching windows through smooth masonry walls, enlarging the usually domestic-scaled, three-part Palladian window form into the Roman triumphal gateway of the west front and topping the whole arrangement with a variation on a medieval broach spire. Standing at the base of the west end tower, it is hard to know if the tower appears to be falling away from you or more worryingly falling towards you, an effect I have not experienced with any other building. None of Hawksmoor’s contemporaries and only a few architects since have achieved this feat of imbuing a static structure with such energy and dynamism. Looking across Hawksmoor’s work, we see an innate sculptural feel for form and mass, and for the capacity of stone to carry meaning and metaphor. His churches are often said to appear Gothic or medieval, yet he conjured these allusions without resorting to a single pointed arch or buttress. Their Gothic-ness emerges through their massing, just as, to our modern eyes, they allude to the concrete constructions of post-war sculptural Brutalism, such as those by Denys Lasdun, Gottfried Böhm or Louis Kahn. It is striking that after all this time Christ Church is still defying our expectations and forcing us to re-think how we see the architectural world around us. Despite the genius of his work, after his death Hawksmoor was overlooked and largely forgotten until recent decades. This was mirrored in the fate of his buildings, which for most of their history have rarely been understood, let alone admired. 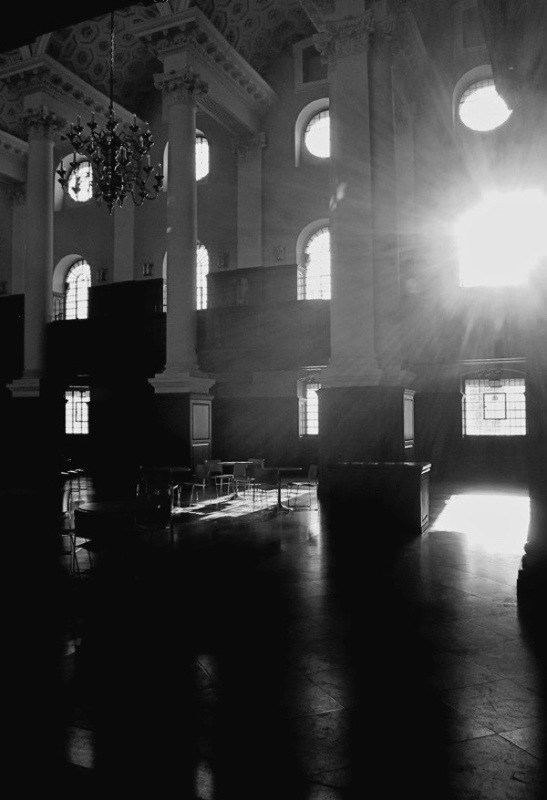 Tragically for Hawksmoor, this began even before his death, as the English Baroque was superseded by the Palladian style, and for the final years of his life he became the last, lonely figure of a generation the Palladians sought to erase. During the mid eighteen-sixties Christ Church underwent substantial alterations under the direction of Ewan Christian, the architect best known for designing the National Portrait Gallery. Christian ripped out the galleries and pews, and changed the window configurations on the sides of the church. By the nineteen-fifties, with the congregation dwindled, the church was shut. 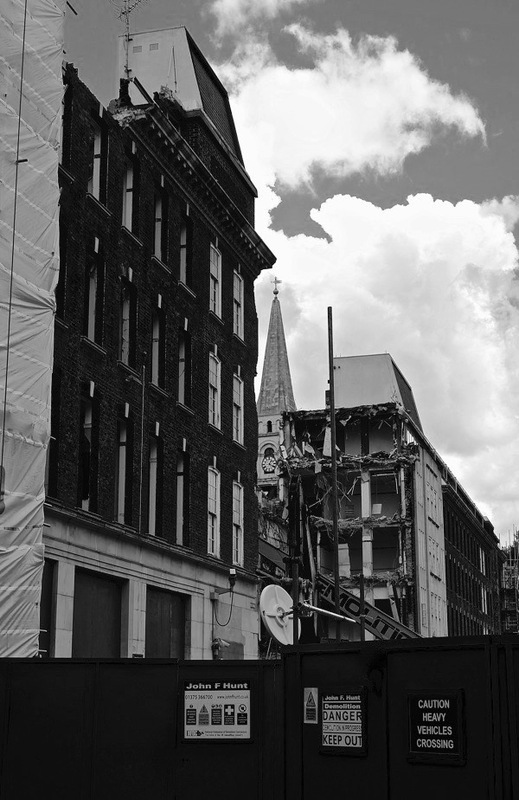 Demolition became a real risk and the Hawksmoor Committee, which had formed to raise awareness of the plight of Hawksmoor’s works, managed to raise funds to repair the roof, largely through the sale of St John, Smith Square. 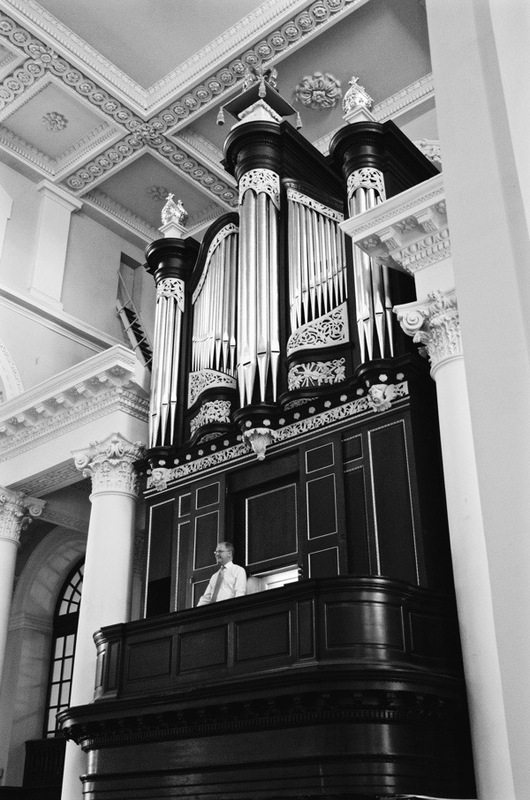 The mantle was then taken on by the Friends of Christ Church, Spitalfields in 1976, who, working with the architect Red Mason, drove the near thirty-year restoration campaign that returned the church to its original configuration, including the dramatic reinstatement of the galleries. The restored interior, perhaps, lacks the romance of the earlier ruinous space where evocative classical concerts were held in the nineteen-seventies, but it more than makes up for it in splendour. Since the completion of the main restoration in 2004, work has continued to restore the organ (reinstalled earlier this year) and to renovate the crypt. 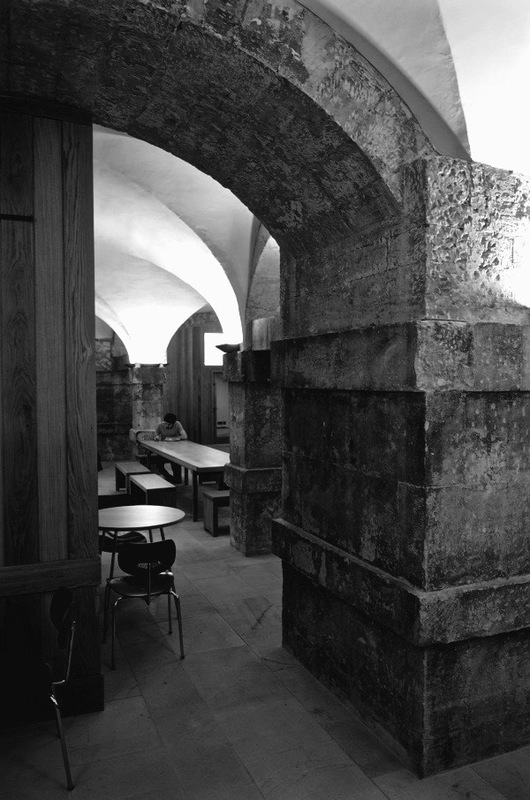 The latter project, led by Dow Jones Architects, stripped out the numerous accretions in a space which has been used for everything from an air-raid shelter to a dormitory for alcoholic men, before sensitively inserting a cafe, events kitchen, lounge space and small chapel, taking architectural cues from Hawksmoor’s nave above. With the public opening of the crypt this month, the entire building is now modernised and fully restored. 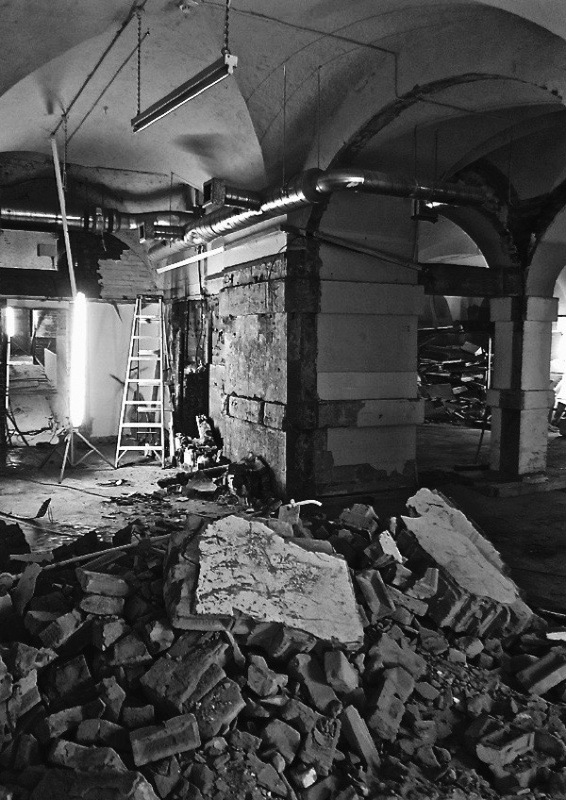 However, unlike other buildings that have undergone such restorations, I sense that Christ Church’s history is far from over and it will continue to perplex and inspire whoever cuts across its path for centuries to come. A great cream-white Ship sailing the seas of Time. I was privileged to be the person who took the “Images of England” photo of this building, & though I am a thoroughgoing atheist, the architecture & solidity of the structure never fails to amaze. 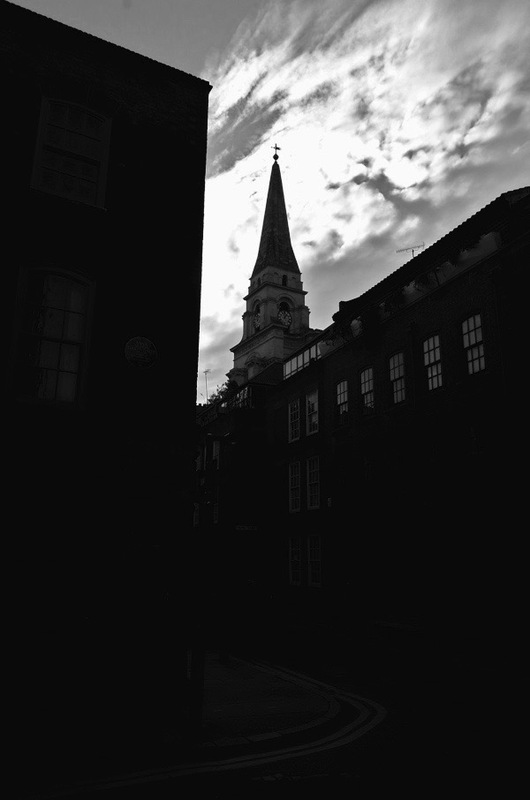 I my mind, I always pair it with another church close by – St Leonard’s Shoreditch. Fascinating,beautifully written. Wonderful pictures. I, too, have only visited CC post its restoration, though pre organ restoration and crypt. I must make another visit! Local people used the crypt as an air raid shelter. Yet no body talks of the night fire bomb broke a window and landed on the windowsill. Men home on leave from the army found a ladder that was too short, so based it on a pew. It was only after it was sorted did they realise they only had one leg of the ladder on the pew!!!! A wonderful post. I too have only seen Christ Church after renovations had begun, although the crypt and organ work had barely begun (or perhaps not yet begun) on my first visit. Mr. Hopkins captured the feeling I had when I first saw Christ Church, from the far end of Brushfield Street. It must indeed have been how the Grand Tourists felt when first seeing the Parthenon–except in my case I didn’t know Christ Church existed, so it was even more of a wonderful surprise. I go back regularly, and the view from Brushfield never disappoints. I am so grateful to those who made it possible for Christ Church to survive, and be fully renovated.